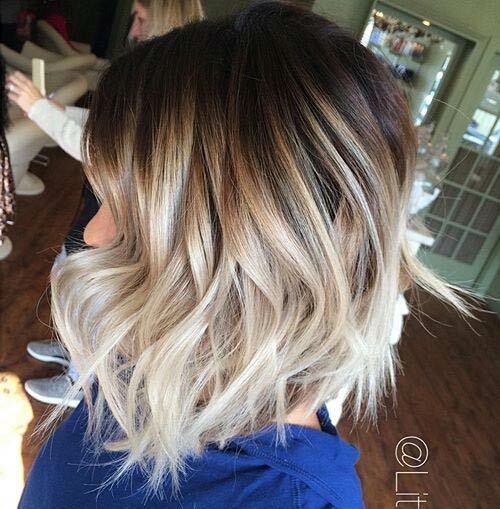 Back to balayage again and this is another classic example of how short hair and this color style works so well together. 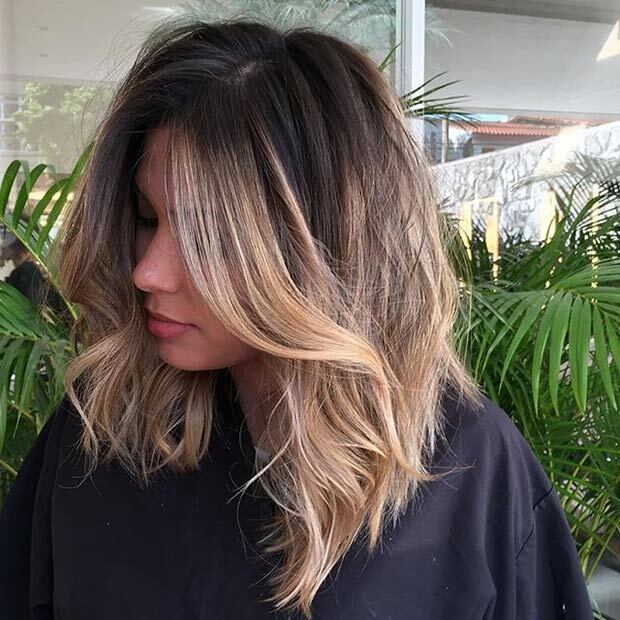 Heading from a darker brown, almost natural root to a really cool, almost icy blonde, every shade is used in between to make this stunning look come across as somewhat natural. 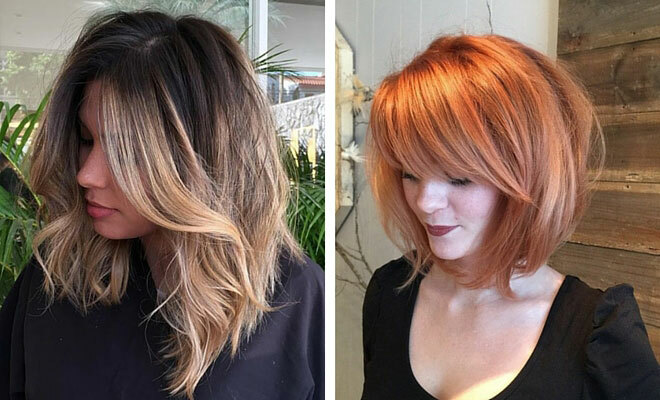 Everyone is dyeing their hair cool and crazy colors right now so why not look at thinking outside the box and heading away from the usual browns, blondes, and reds you’d normally opt for. 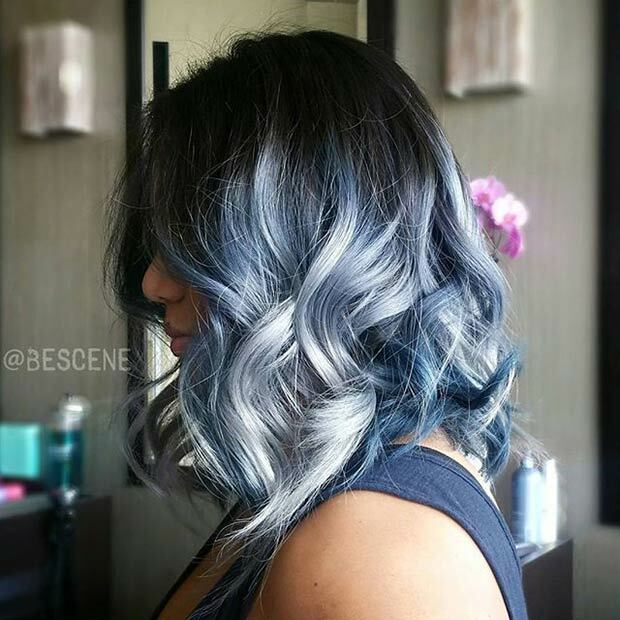 Blue hair, for example, is very much on-trend right now and with different shades of blue, lilac and silver, you can recreate this beautiful short and curly look. Don’t forget – if you have longer hair, the curls help to make it look shorter so you can easily recreate this exact length if you have shoulder-skimming hair or just below. The caramel colored highlights help to add depth here and is a great idea if you also have fine or thin hair. Just because you have short hair doesn’t mean you don’t get to play around with color. What about a pop of color such as this purple/lavender delight? Blonde and lilac go really well together but you could also go for blue, red, pink or in fact, any color you like. It’s a very simple way to instantly revitalise a short look, and if you keep the length at the front like you can see here, you can make the most of that pop of brightness. If you don’t have bangs but you fancy giving them a try, fake it like you can see here. The deep side parting helps to create a flick of shorter hair which helps to frame the face and with the help of a heated styling brush, you can achieve the high-glam flick. Plenty of smoothing serum will be needed to keep this look in check but if you’ve got short hair, it’s definitely one you could recreate. This is a great style if you’re growing out a shorter cut into longer locks. 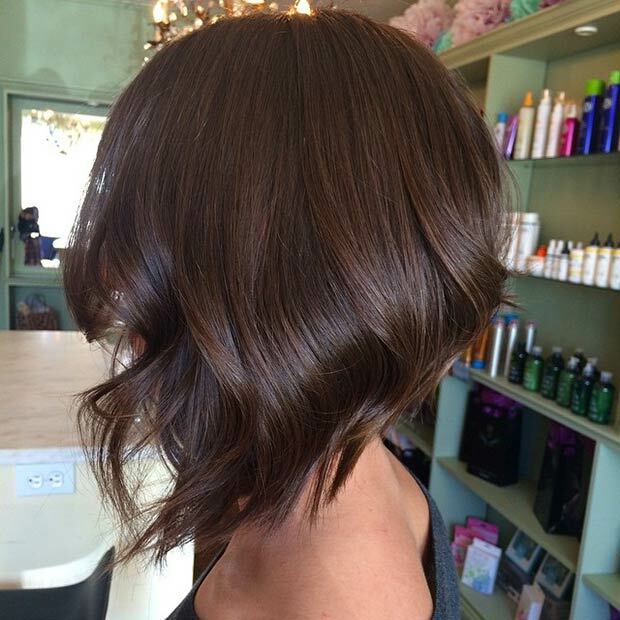 The in-between stages are always a nightmare but with this layered long bob, you have the perfect solution. 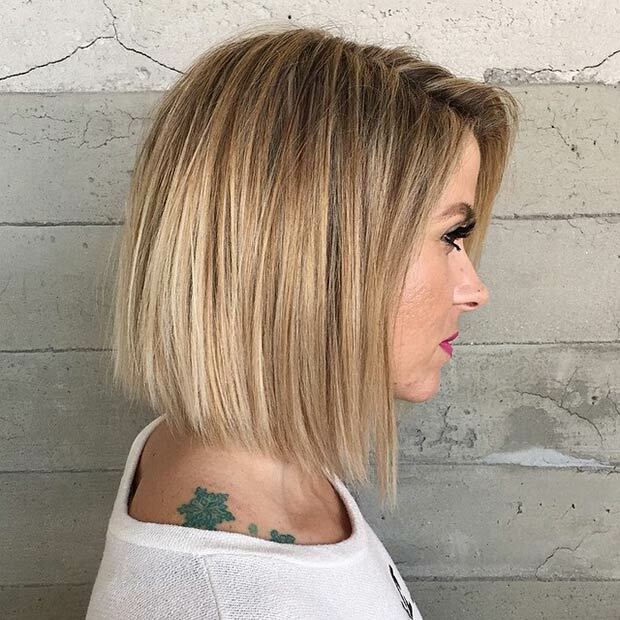 Keeping the front long and the back short, you get the flattering face-framing tendrils to keep things feminine, and the gold blonde highlights help to pump up the appeal. 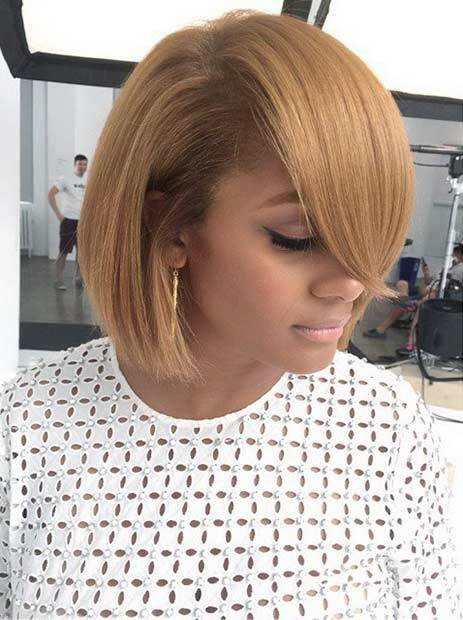 Another inverted bob, this one looks simply stunning. Easily tousled into curls with the help of a curling iron, there is still enough length to the style to be able to twist it into various designs, while still being short enough to be low-maintenance. 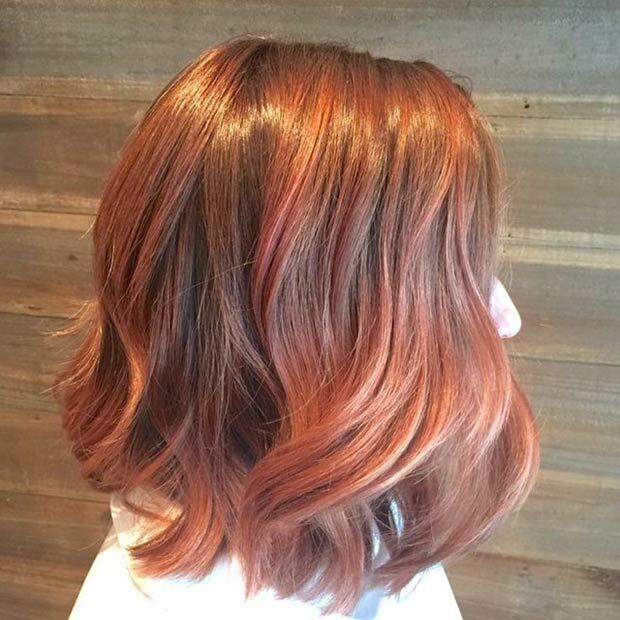 You don’t need to go bright red in order to go red and although the balayage style gives you the opportunity to play around with brighter tones of the colors you love the most, you don’t need to go all-out with it if you don’t want to. Keep things muted by sticking with your usual browns and blondes and add a hint of color just like the slight hues of brown – strawberry blonde – red you can see here. Gigi Hadid recently sported a faux-bob like this on the red carpet and it will shut you every bit as much as it suited her as long as you get the length right. If you’re worried about a round or square face, always go longer and more tapered at the front to make it more flattering, and if you have long or oval faces, make sure you add a little extra volume at the roots to stop it looking too limp. Who said short hair needed to be hard work? If you’re going from long hair to short hair, you might as well make a massive style statement by playing around with a bit of color too. 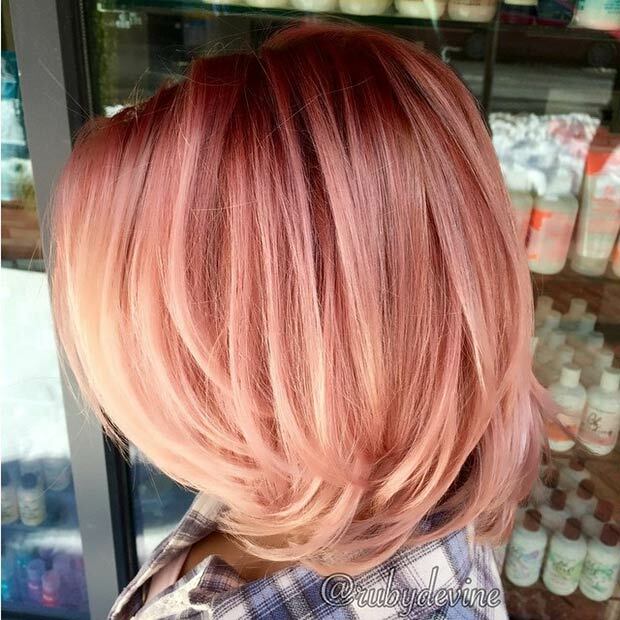 While you’re rocking this super cute short and choppy/flicky bob, why not add a statement color like this rose gold and pink design? Muted/pastel pinks work really well with most short cuts and there’s nothing to stop you from going bolder and brighter later on if you wanted to. I love the pics of the hair styles on your site. I have really long hair and the long hair styles are awesome. I’m thinking of cutting my hair and the cuts on your site are very attractive also.